Procurement for the State of Alaska is expected to exceed $12.1 billion in 2013. The five areas in which this money will be spent is resource development, education, public safety, transportation/infrastructure, and military support. The State of Alaska offers a wide variety of opportunities for small and large businesses to compete for government contracts.We have included the following information to assist you with developing a business relationship with the State of Alaska. Vendor List until a completed application is received. 2205: or TDD-Anchorage: (907) 276-0502.
a. A copy of a cancelled check for the business license fee. c. A copy of a receipt from the State’s Business License Office for the license fee. d. A sworn affidavit that the bidder has applied and paid for an Alaska Business License. 4. The location code section of this application must be filled out. each location and list the service(s) you will provide for that location. 6. Any future changes to the information provided on your application must be submitted in writing. The goal of our Sell To States website is to assist you in finding answers to difficult questions concerning safety regulations. We reference the FHWA – Federal Highway Administration and MUTCD – Manual on Uniform Traffic Control Devices web sites and many state web sites daily in an effort to assist our customers with their safety questions. So, we are sharing our references to better assist anyone needing information that these sites may provide. This web page provides a source of basic information on DOT products and specifications. Products and specifications can change without notice. Always verify that materials meet the specification for the project you are bidding. We hope that this information will be useful for you. If you find any dead links, we will appreciate you letting us know by emailing us at steve@reflectivestore.com with the link information. Please email or call us at 850.934.3157 if we can further assist you with questions. pavement markers on the completed pavement. Basically, a commodity code assigns a numeric value to a good or service for the industry to which that good or service belongs. For example, the NIGP commodity code for an electric water fountain is 225-30. Commodity Code lists are a collection of industry or class-item numbers and descriptions used to specifically code products and services to their corresponding industries. These lists are used by state agency buyers and private vendors as a baseline for descriptions, definitions, and standards for goods and services in the procurement process. This develops a general identification for purchasing agents to code their requisitions so that formal and informal bids are addressed to vendors that are capable of furnishing the required materials, equipment, supplies, or services. It is important to identify the proper commodity codes as specifically as possible when you register as a vendor to insure that you receive notification of bid opportunities. Many states require between 1 and 3 commodity codes at registration, however, you will be able to modify these codes at a later time. The commodity code lists will be organized by their numeric index, however, an alphabetical list may also exist. The lists are generally organized in a systematic fashion based on the industry to which it applies. State agencies purchase everything from hospital equipment to fertilizer, so you can imagine the size and scope of the commodity code lists used. You can find the codes that apply to your business in several ways. You can search through the commodity code list to find the class and category which best fits your business. Or, you can search through the registered vendor’s list to find either the manufacturer of your products or competing businesses that sell similar products. I have found valuable information and ideas by using the registered vendor’s list as my resource to code my products. It is less time consuming and less frustrating, as well. If you cannot find the codes that you need, then please remember that most states offer a 1-800 help line to assist you with commodity code and other registration questions. Some states or state institutions create their own commodity lists based on a data base of previously purchased products and services. Other states cross reference their QPL or Standards and Specifications lists to create the state commodity code list. There are a number of government coding systems that serve a variety of purposes. We have provided additional information about some of the most referenced commodity code list. The following is a basic overview of some of the more commonly used commodity coding systems. The NIGP (National Institute of Governmental Purchasing) commodity code is a five-digit class item number. It is one of the most commonly used commodity code lists because it is thorough and fairly straight forward. The first 3 numbers designate the class and the final 2 numbers identify the item number. Combining the class and item number determines the commodity code. Please click on the NIGP link as I will refer to the Texas State Procurement website NIGP list for the following example. To determine the commodity code for sandpaper, combine the class number 005 – abrasives (click on 005 to go to sub categories) with the item number 14 – Abrasives, Coated: cloth, fiber, sandpaper, etc. to find that the NIGP commodity code for sandpaper is 005 14. As you review the NIGP list remember to click on the 3 digit class number to access an item list of all products that are categorized in that class. For a $25 fee, you can find the NIGP code that best describes your product or service by visiting NIGP.com. NAICS (North American Industry Classification System) was adopted in 1997 to replace the SIC Code. It was developed jointly by the U.S. Economic Classification Policy Committee, Statistics Canada, and Mexico’s Instituto Nacional de Estadistica y Geografia. The purpose was to gather and compare business statistics among the North American countries. NAICS (pronounced Nakes) is the Federal standard for classifying business establishments (single location) for the collection, tabulation, presentation, and analysis of statistical data describing the U.S. economy. It groups establishments into industries according to similarity in the processes used to produce goods or services. The U.S. Census Bureau assigns one NAICS code to each establishment (business location) based on its primary activity and various other government agencies adopt the NAICS classification system for their own purposes. NAICS is a 2 – 6 digit hierarchical classification system, offering 5 levels of detail. Each digit in the code is part of a series of progressively narrower categories, more digits = greater classification detail. To re-visit our sandpaper example, the NAICS classification for sandpaper is 327910 – abrasive product manufacturing. The first part – 32 indicates “Manufacturing” sector; -79 is “other nonmetallic mineral product manufacturing” and -10 represents “abrasive product manufacturing.” Please click NAICS to view the 2007 NAICS Sector codes and titles. To determine the NAICS codes for your business, then search at www.census.gov/naics using the “2007 NAICS Search” box at left. Enter a keyword that describes your kind of business. A list of primary business activities with that keyword and corresponding NAICS code will appear. A second way to determine your NAICS code is to view the complete 2007 NAICS structure with codes and titles, then choose the 2-digit sector code for a list of all 6-digit codes and definitions in that category. If you know your SIC Code, then you can cross reference it with the 2002 NAICS code. The SIC CODE (Standard Industrial Classification) codes are used by the U.S. Government to classify business types. A company is typed based on its main industry, line of business, or function. The SIC code for our example sandpaper is D3291. Division D – Manufacturing; 32 – stone, clay, glass and concrete products; 91 abrasive products. Please click on the highlight name, SIC Code to view the SIC Code list. The NAICS replaced the SIC in 1997. There will be no further revisions of the SIC Code, however, many state and local agencies continue using the SIC Codes for their own purposes. The HS (Harmonized System) number is a 6 digit code for general commodity categories. The HS codes are used by importers and exporters to classify products for custom purposes. Import codes are administered by the U.S. International Trade Commission (USITC), and export codes (or Schedule B numbers) are administered by the U.S. Census Bureau. Knowing the product’s HS number is important for determining the appropriate tariff rates and preparing shipping documents such as the Shipper’s Export Declaration and Certificate of Origin. The HS code for our example, sandpaper, is 680520. The category for stone/glass is 68; -05 is for abrasive powder etc on a base of text material etc; -20 is natural or artificial abrasive powder or grain, on a base of paper or paperboard only. As we have discussed, there are many commodity coding systems for a variety of industry purposes. Government procurement agencies may use one or several of these lists to code their bid requests. It is to your advantage to identify the commodity codes that best represent your products or services because invitations to bid are matched to businesses by the industry commodity codes. Standards and specifications are the benchmark for measuring product performance. They communicate a common set of expectations and establish the integrity that all products must meet or exceed. Standards and specifications provide guidance and instruction on how goods and services are to be designed, constructed, manufactured, or tested. The specifications outline essential or technical requirements for specific goods or services. Standards provide guidance for general applications. The U.S. Federal Government, most individual U.S. States, and several industry and international organizations maintain a list of these guidelines. If you are doing business with a government agency, it is your responsibility to understand, perform , and document completion of work within these requirements. If you have questions or concerns about a specific requirement, then you should first contact the purchasing agent or project engineer. If your state does not maintain a Standards and Specifications List, then the state procurement agency should let you know if the Federal List of Standards and Specifications is a substitute guide. We have provided a list of known State Standards and Specifications Lists in the second part of this article. However, you can view the Federal List of Standards and Specifications here. Dun & Bradstreet (D&B) assigns a unique nine digit number to each physical location of a business to identify unique information about that business in that particular location. This 9 digit number is a Data Universal Numbering System or DUNS Number. If your business maintains multiple locations, then you will be assigned multiply DUNS Numbers. This registration is FREE, but required by all businesses seeking to register with the Federal government for contracts or grants. Usually the number can be assigned within 1 business day. For more information please visit D&B.com. Posted in Business Articles	| Comments Off on What is a DUNS Number? / How Do I Register for a DUNS Number? A Federal Tax ID, also known as a Federal Employer Identification Number (FEIN or EIN), is a nine digit number. It is a permanent number for your business which acts like an individual person’s social security number. It is used for banking, tax filing, business identification, applying for business licenses, credit reporting, and other business purposes. A business will be assigned one EIN which is valid in all states. It can be used immediately, however, it may take up to two weeks before this number becomes part of the IRS’ permanent records. You should apply early enough to have your EIN before you need to file a tax return or make a bank deposit. You can apply online IRS EIN, or call the IRS Business & Specialty Tax Line at 800-829-4933. To apply by fax or for other information please visit the website “How to Apply for an EIN” at http://www.irs.gov/businesses/small/article/0,,id=97860,00.html. Posted in Business Articles	| Comments Off on What is a CCR or CAGE Code? In the Access eProcurement (eP) box click on Register to create a new eP supplier Registration button. 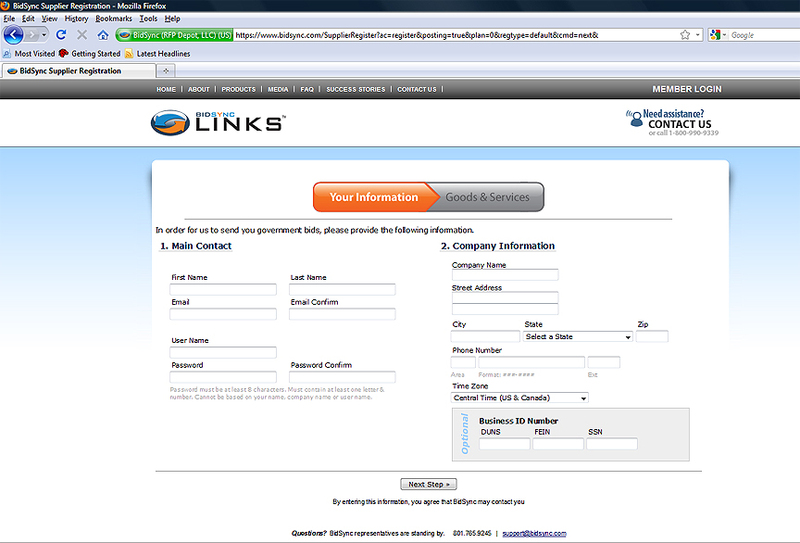 Then open the California Supplier Registration button on the left side of page – this is a FREE Registration. First, select Primary Industry, then enter at least 3 keywords, and click SEARCH. Check the box next to matching classification and click Add. Mark the states where you conduct business. UN-CHECK Include BidSync Links Plus Bids – because you are registering for the free service and BidSync Links Plus is a fee based subscription. 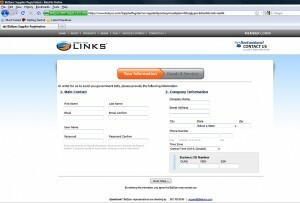 Now you have successfully registered with BidSync Links. You will be notified by email within one business day informing you that your account has been activated, or call BidSync Support at 1-800-990-9339 to activate your account immediately. I became confused when I tried to register for the State of California Vendor’s list because I found myself leaving the state’s site only to be deposited on the BidSync Links website. 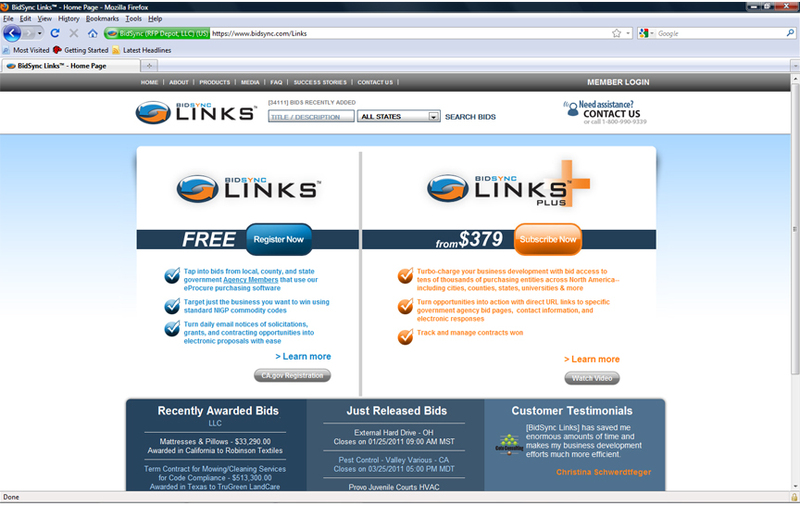 To add to my dismay, I saw that I had two choices – a BidSync Links FREE registration (in blue) or a BidSync Links Plus $379+ Subscription (in orange). At this point I returned to the California website thinking that I had made a mistake. I soon learned that California, as well as over Utah and 300 other U.S. city and county agencies use BidSync as their online eProcurement management tool to develop, manage, analyze, post, and correspond with vendors about Request for Quotations. A BidSync Links account for these states is free. I am sharing my first experience with BidSync Links with you so that the process will go smoother for you. Although I am using the State of California for this example, the other states will be similar. Registering with BidSync Links is the first step for vendors that wish to do business with any of the U.S. States the employ the BidSync Links system. I intend to cover the basic BidSync Links registration information. In the menu to the right, there are other articles which discuss in more detail the differences between BidSync Links and BidSync Links Plus. 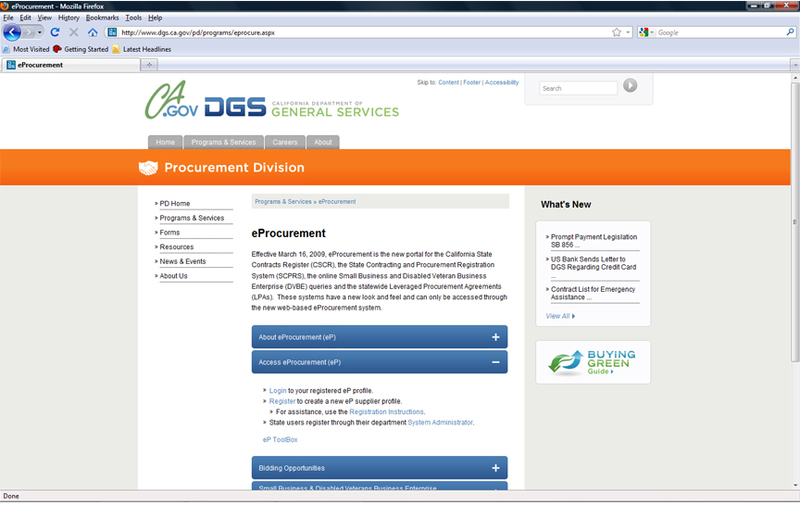 Above, I have included a picture of the State of California’s Procurement Division web site. From here, I clicked the heading “Access eProcurement” and then clicked “Register to create a new eP supplier profile.” At this point, you will be on the first BidSync Links web page. Do not be confused because this is the correct path. The picture below is a snap shot of the page. Click to read more about BidSync Links FREE registration and BidSync Links Plus FEE subscription to help understand which option best fits your business. If you choose the FREE BidSync Links registration, then you will open the following web page and proceed with your BidSync Link FREE registration. You will be able to follow the registration instructions provided in Part 2 of this article. Part 2 – Steps to Register with BidSync Links! BidSync Links is an electronic bid notification and eProcurement services connecting vendors and suppliers to government agencies seeking to purchase products and services. BidSync contracts with many government agencies to announce and manage new bid/contract opportunities for large budget purchases requiring competitive bids. Many local cities, counties, state and federal offices, schools and universities, and military branches are some of the organizations posting their Request For Quotes – RFQs – with this online eProcurement agency. Vendors can register for email bid notifications. However, access to the RFQ information is often limited without also registering for BidSync Links Plus. There are advantages for both purchasers and suppliers with the BidSync Links program. Whether you are a procurement agent or a vendor, you must first set-up a user account. If you are a procurement officer, manager, or buyer, then you will be able to create a RFQ. Vendors will be notified by email of RFQ based on the commodity codes selected at registration. The BidSync Links eProcurement notification system provides a bridge between vendors and suppliers to government agencies. With hundreds of new bid opportunities each day, the BidSync Links system matches the RFQ with the commodity codes for your business. The basic registration enables you to receive new bid notifications, however, to view and bid on most contracts, you will need to register with BidSync Links Plus. The best way to tell you what BidSync is – is to show you what BidSync does. It is that easy! Now, you have a current listing of all the bids, auctions, and sales for Oklahoma City with a URL link to the “Invitation to Bid” documentation at each listing. Remember to bookmark this site for future reference, but take time to look over all of the listings. Isn’t that easy! This is a direct link to the City of Philadelphia Procurement Department. This page covers vendor registration, bidding, contract information, and current solicitation listings – with URL links to the “Invitation to Bid” documentation. Remember to bookmark this site for future reference, and take time to look over the bid opportunities. This link will take you to the City of West Palm Beach’s approved vendor list for lawn care maintenance companies. It also provides other value information for Doing Business with the City, current procurement opportunities, small business information, and contact information. Remember to bookmark this site for future reference if you live in this area. 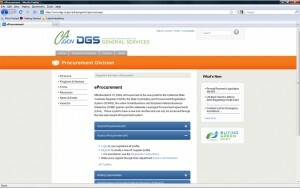 It is that easy to locate procurement websites for local, county, and state agencies. You can substitute “purchasing” for “procurement” or add industry specific goods or services descriptive words. Choosing target search words will help you zero in on bid opportunities for your business. Also, some procurement websites have built-in subscription links, called RSS links, that will automatically send email notices when the postings are updated. So, what does BidSync Links do? They do what you just did for 70,000 procurement websites everyday. BidSync is a clearing-house of information. They collect all new bid opportunities posted on the web, analyze these listings by geographic location, match the NIGP commodity codes to vendors, and sends out Request For Procurements to vendors registered with BidSync. These new bid notifications come from two sources. The first source is from government agencies that have purchased and use the BidSync software for creating, organizing, managing, and paying for the bid contracts. All vendors that register for the FREE BidSync account can access these bid opportunities because the state or other agency has paid the software subscription. The second source of bid notifications comes from the actual procurement websites, such as the Oklahoma City and the City of Philadelphia Procurement Departments, where new bid opportunities are listed. BidSync combs procurement sites looking for new Request For Proposals to report to registered vendors. BidSync Links subscribers receive notification of both types of bid notifications. However, only BidSync Links Plus subscribers/members have access to the bid notifications obtained by combing the procurement websites of NON-MEMBER government agencies, which is the method we used to find the bids for Oklahoma City and the City of Philadelphia. Therefore, the question is, do you need to subscribe to BidSync Links Plus. The answer to that questions really depends on your business market. If your business provides goods and services to a regional area, then you may find that performing your own procurement searches enables you to target RFP for the products and services you offer in the geographic areas in which you desire to do business. If this is the case, then the free BidSync Links account will probably be sufficient. If your company does business in more than one state or manufactures or distributes products in a large geographic area, then registering with BidSync Links Plus will probably be very beneficial. Remember, that BidSync is a clearing-house of information. They bring in new bid opportunities from all of the cities, counties, states, military, and the federal government agencies, digest geographic regions, and pair vendors with proper commodity codes, then send out email notifications. BidSync manages an enormous amount of information everyday. BidSync Links Plus membership offers valuable bid opportunities for many businesses. 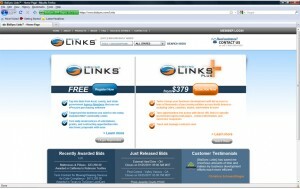 Is BidSync Links Plus for right for your company? We hope this article will help you make a more informed decision. The video below explains BidSync Links Plus in more detail. The budget for the State of California is roughly $120 billion dollars each year with the private sector for products and services. This equates to 30% for K-12 Education; 25% for health and human services; 11% for higher education; 10% for business, transportation, and housing; and 7% on corrections. The California eProcurement website is the direct route for state agents to purchase goods and services from businesses. Becoming a registered vendor enables purchasing agents to find you and makes your company eligible to bid on contracts. The following information is provided to assist you in becoming a registered vendor for the State of California. The State of California utilizes eProcurement website hosted by BidSync for vendor registration and online contracting opportunities. Vendor registration is a two-part process. The first step is to “Register to do Business with the State of California.” At this point you will create a user ID and password, list your business name and contact information, and choose the commodity codes for your business. You only need one of the following numbers to register your business at this stage: DUNS, FEIN, or SSN. When complete, you can call BidSync Support to activate your account or wait to receive your emailed confirmation. Your account must be activated to proceed to the next step in the registration process. D. Find the PROFILES box on the left of screen just below the menu bar – choose The State of California and complete the profile information. D. Find the PROFILES box on the left of screen just below the menu bar – choose “Add SB/DVBE Certifications” and complete registration. Please remember to refer to the CA.GOV DGS homepage for information concerning bid opportunities, statewide contracts, and other eProcurement resources. In addition, you will be given the opportunity to sign-up for BidLync. The difference between BidSync and BidLync is that BidSync is a FREE email notification service, and BidLync is a fee-based membership. The only bid opportunities that you will be able to access with the free BidSync are the bids posted by agencies that have paid the membership fee to publicize their bid notifications. Annual membership with BidLync provides access to bids posted by agencies that have NOT paid to publicize their bid opportunities. Your annual membership provides access to 10s of thousands of additional bid opportunities through BidLync, an online catalog of regional, state, national, federal, military, and international bidding opportunities. The registration fee begins at $379 and offers electronic bidding and procurement opportunities. Remember, if you do not register with the BidLync program, then you can elect to be notified via email of bid opportunities, however, you will be denied access to the bidding process through the BidLync portal. The following web pages are good resources to assist you in doing business with the State of Florida. Your first step is to register as a vendor with the State of Florida at MyFloridaMarketPlace. MyFloridaMarketPlace links purchasing agents and registered vendors together and facilitates the contract process from the bidding stage to the final payment. The second step is to accept the emailed Terms and Conditions so that your account can be activated. if you are a business 51% owned by a minority, woman, or service-disabled veteran. The last step is to complete a State of Florida CBE (Certified Business Enterprise) application. We have provided information and links for this process. If you need assistance, please email Vendor Help or call 866-FLA-EPRO (866-352-3776). Step Two – READ and ACCEPT the Terms and Conditions of Use to activate your account. This will be emailed to the contact email address you provide during vendor registration. There are several note-worthy items to mention. First, you are agreeing to a 1% fee payable to the State of Florida on all contracts that you win. There is a monthly deadline for payment when this fee applies. Second, you will have a limited time frame in which to supply an itemized list of products and pricing if requested by a third party. Step Three – State of Florida CBE (Certified Business Enterprise) application. Visit the Office of Supplier Diversity (OSD)for information on becoming a Florida Certified business. The purpose of this department is to improve business opportunities for Florida’s minority, women, and service-disabled veteran business ventures. This department is divided into the following categories: certification, advocacy and outreach, vendor resources, agency resources, publications, and the certified vendor directory. We have provided a few links that are helpful to understand why and how to become a Florida Certified Business Enterprise. The Qualified Products Lists (QPL) identifies the products that have been tested for conformance with the appropriate specification requirements. There are many QPLs, also known as approved products lists. The federal government maintains a list, while most states maintain their own qualified products list. The approved products lists are valuable resources for contractors, manufacturers, and distributors. *Maintain these records for submission with your bid or invoices. If you are doing business with an agency that does not maintain a QPL, then consult with the engineer or procurement agent about the job parameters. Many times you can refer to the federal standards and specifications. *Recognizes your company for producing high quality and reliable products. To obtain information for QPL approval, visit your state website to download the evaluation package. Each state that maintains an approved products list will also provide instructions for the application process and usually offers online assistance. Also, remember to consider QPL approval for other states as well. The Qualified Products List is a valuable resource for distributors. By identifying materials on the QPLs, you can expand the products you sell by selling in smaller quantities. If your company can supply materials in demand quickly and in the needed quantity, then you do not need to compete on price with the manufacturer. Use the commodity codes to search for products within an industry. Manufacturers sell in bulk to government agencies, however they welcome businesses that can repackage their materials in smaller quantities. Often small towns or counties will purchase these products from a distributor because the minimum order requirements suit their application and budget. Contractors that have been awarded government contracts also purchase from approved products lists in smaller quantities. Vendors must register with the State of Alabama in order to receive solicitations to bid. There is a $200 registration fee which provides access to the bid solicitations for two years. You will need an access code to begin vendor registration. Click here to setup the vendor log-in information. Taxpayer Identification Number – All vendors are required to use the precise legal name associated with your taxpayer identification number. Sole proprietorships may use either your social security number or employer identification number, however, your own name must be in the title. Failure to use the legal name associated with your taxpayer number may result in the imposition withholding of 31% of each payment. YOU assume ALL responsibility when registering with your social security number. Foreign Corporations (Out-of-State Firms) – Alabama law states that a foreign corporation may not transact business in the state until it obtains a certificate of authority from the Secretary of State, Corporation Division. Their telephone number is 334.242.5324. You may proceed with the vendor registration without this certificate, however, again you may not transact business in the state until it is obtained. 2. Vendor Number: Enter either your FEIN (Federal Employment Identification Number) or Social Security Number. YOU assume ALL responsibility when registering with your social security number. B. Minority and Women Owned – At least 51% owned by one or more socially and economically disadvantaged individuals AND whose management and daily operations are controlled by one or more of those individuals. 4. American Indian (including Alaskan Native). If you do not have an access code, or have not previously registered, CLICK HERE, to begin online Vendor Registration.